If you live somewhere where a fast, reliable, and cheap internet connection isn't a given, or if you own a smartphone that crawls at the mere sight of a 5MB+ app, there's no arguing the benefits of Opera Mini as a go-to browser. The app also gets very frequent updates that improve its usability, like a QR code reader, night mode, different data compression modes, and more. Now Opera Mini is ready to join its big brother by adding the video compression feature that Opera users have been enjoying for the past months. Opera uses its own Rocket Optimizer technology to compress up to 60% of video data, which results in faster loading and less consumed bandwidth. 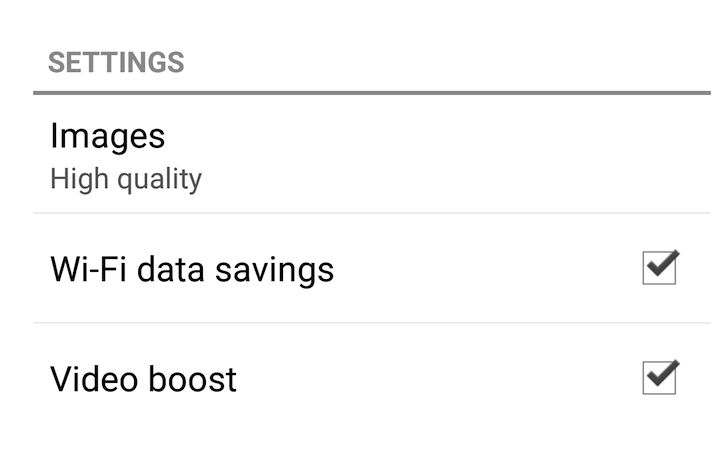 The feature is available to activate in the High data savings mode, under Video boost. Also new there is the option to compress media and save data even when on a Wi-Fi connection as opposed to just a data connection. But this big version 15 update doesn't stop here. Opera has added support for uploading and downloading files from the SD card on devices that support it. Image uploads now also offer the option to shrink the size before being uploaded — a feature I have always wanted in our modern 16MP-camera-4MB-images days. And there's a new fast scrolling handle that shows up on the right side of the screen when you're trying to swipe through a webpage. It lets you hold it and drag to quickly skip through long pages. And finally, this version is supposed to support automatic status bar color changes on Lollipop and Marshmallow devices, but I couldn't get it to work. I tried visiting different sites like our own Android Police, Facebook, APK Mirror, and others that usually trigger this change in Chrome, but it didn't work in Opera Mini on my LG G4. It might be a work in progress or a bug affecting the way things are managed with LG's interface. Opera Mini is free to grab on the Play Store from the link below or you can manually download the APK and install it on your device.